The state of Missouri was admitted to the Union as a slave state with the passing of the Missouri Compromise in 1921. In commemoration of the centennial of Missouri’s statehood, the Missouri Centennial Exposition Committee planned a large Exposition and State fair for that August in the state’s first capital, Sedalia. To help fund the festivities, the Committee sought a commemorative coin to help defray costs. 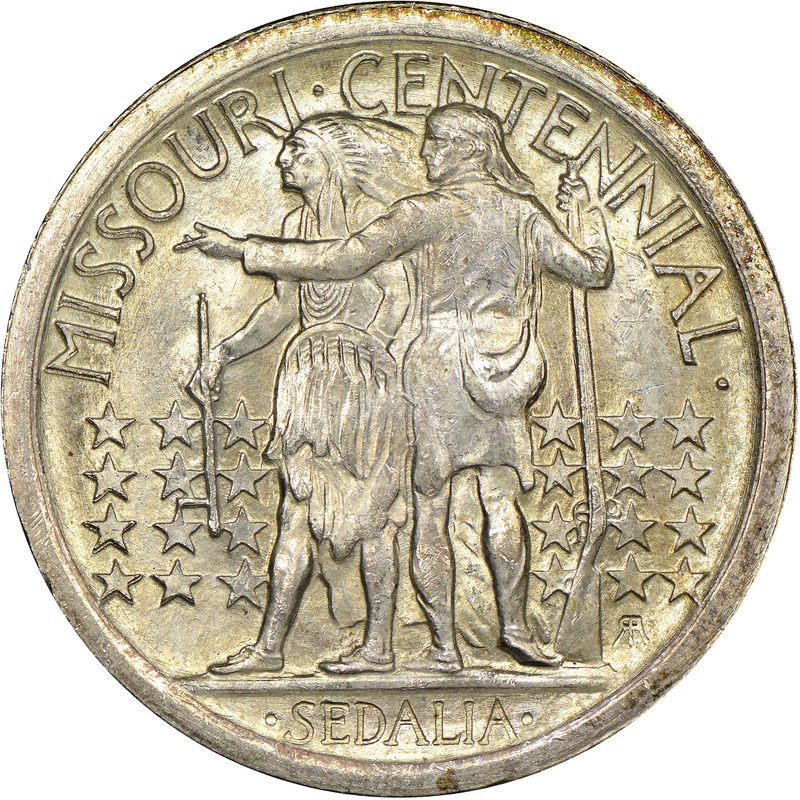 On March 4th, 1921, Congress approved legislation authorizing the striking of up to 250,000 Missouri Centennial half dollars. Robert Aitken, designer of the Panama-Pacific fifty-dollar gold pieces, was selected to design the Missouri commemorative half dollar as well. 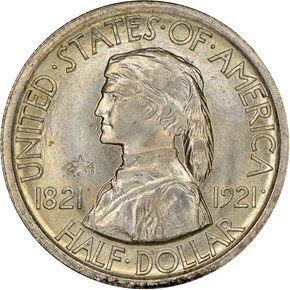 His obverse depicts a profile view of Daniel Boone. Boone wears a coonskin cap and buckskin shirt and is flanked by the dates 1821 and 1921. Encircling the periphery are the inscriptions UNITED STATES OF AMERICA and HALF DOLLAR. Aitken's reverse design features a frontiersman pointing westward with a Native American at his side. They are surrounded by twenty-four stars, reinforcing Missouri's admission as the twenty-fourth state. 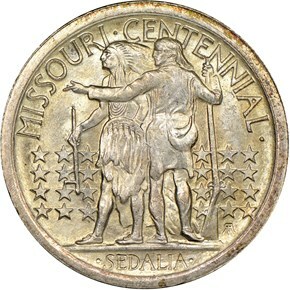 The legend MISSOURI CENTENNIAL is above and the city name SEDALIA below. Surprisingly, the usual inscriptions LIBERTY, E PLURIBUS UNUM, and IN GOD WE TRUST are absent from this coin, likely due to insufficient space. The coin is sculpted in high relief, giving these coins an almost medal-like quality. 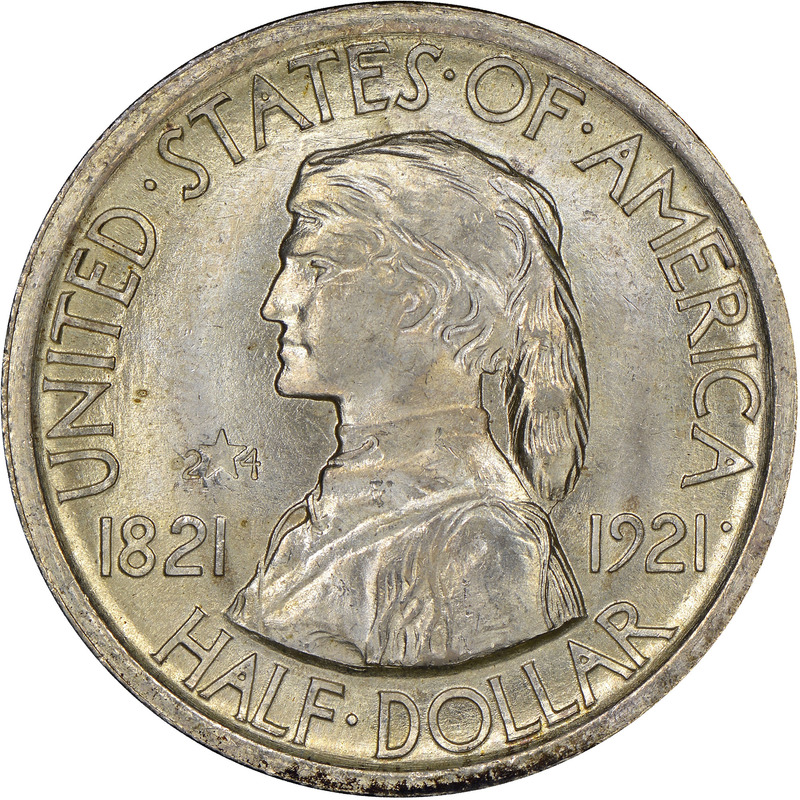 The Philadelphia Mint struck 50,000 Missouri half dollars in July 1921. 5,000 of those pieces had a special marking to the left of Boone on the obverse. The marking is an incuse star with 2 and 4 on either side, signifying Missouri’s place as the 24th state in the Union. The entire purpose of this marking was to increase sales as it was a variety collectors would want. Due to this, most of those with the 2*4 were sold to collectors, and today, they are nearly of the same rarity in upper grades. In the ends, 29,600 of the non-2*4 variety coins were melted, leaving a net mintage of 15,400 for those, and 5,000 with the special notation.